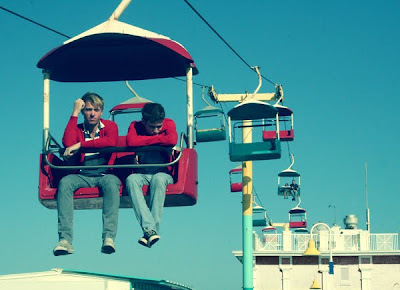 We've been digging these guys hard since we copped their debut self-titled album, The Drums. We even posted up the video for "Forever and Ever Amen" a couple months ago. Now, on the back of the success the Brooklyn retro rockers are having touring overseas, they've just announced a full stateside tour along with Surfer Blood. And, as an added bonus, they've given the green light to post up their album's hidden gem, "Down By The Water." A slo-mo '50s style rocker, the cut sounds like it should only be available as a 7", and hearing it , we can't help but think of Stand By Me. It oozes with the rhythm & blues rock of a bygone era, but the sparkling synths are totally today. If you're one to rock saddle shoes, tortoise shell glasses, gingham shirts or selvage denim, this song needs to be part of your personal soundtrack.